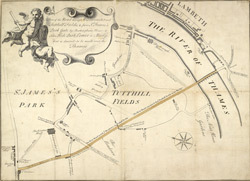 This engraved plan shows the road through Tutthill Fields in Westminster leading to the new bridge at Vauxhall. The plan's title features in banner at top left, with compass star at bottom right. The proposed new road stippled and highlighted in colour.